Oxygen producing plants in the home are great factors of longevity. Bringing oxygen producing plants into your home is a way to mimic the healthy lifestyle factors of longevity in humans from the longest lived cultures. Green oxygen producing plants are abundant in nature, especially in forests, jungles and coastal regions by the ocean (seaweeds, algae and marine phytoplankton make up the overwhelming majority of the worlds oxygen producing plants). If you've ever spent time in or near these settings, you'll know how refreshing and revitalizing they are! Oxygen and the air it is contained in, could be considered the most crucial nutrient to the human body because life can only last mere minutes without it. Every cell in the body uses oxygen for fuel (as well as glucose). Brain function quickly drops when it is not supplied with adequate oxygen. If it falls too low to quickly, a stroke can occur. Cancers and many pathogenic diseases are destroyed by oxygen, which is why hyperbaric oxygen chambers are used as such powerful life saving tools. These chambers can also reverse all the side effects of a stroke if a person who has just suffered from one is placed into one within an hour or so. The ratio of oxygen to other molecules in the Earth's atmosphere has been dropping over several decades. The majority of this problem is due to air pollution increasing and less to the fact that the forests and jungles of the world are being reduced by clear cutting (which should still be stopped). Areas of higher pollution, such as cities, have a lower percentage of oxygen in the air. I hope that these oxygen facts help illustrate the importance of bringing both oxygen producing plants as well as air cleaning plants into your home for life-span development. Dr. B.C. Wolverton, a former NASA research scientist, helped the agency look into how air purifying plants could be used onboard space missions to benefit the artificial environments onboard their spacecraft. This NASA Clean Air Study found that oxygen producing plants can be used to both produce oxygen as well as remove common harmful chemicals from the air and break them down into harmless organic byproducts into the soil, which the plants then use as food! These chemicals that are harmful to human health are off-gassed from common household items and products. Some of these items and the chemicals they release are found in synthetic carpets (releases formaldehyde), petroleum products (release benzene), toys, chemical cleaners, paint, furniture with synthetic components and everything else that is synthetic! All air cleaning plants will of course always produce oxygen, but here are some of the top ones that happen to have a high conversion rate of carbon dioxide (the waste product humans and animals exhale and that plants inhale) to oxygen. The major benefit of adding oxygen producing plants to your living and work space is an increase of productivity due to the maintenance of healthy oxygen levels in the blood. #1 Sprouts! : If you grow your own sprouts for food (especially sweet pea sprouts, buckwheat sprouts and sunflower sprouts) you will have a fantastic mini greenhouse effect in your living space. You also get supplemental oxygen orally by eating raw, living greens! #2 Snake Plant a.k.a. Mother-In-Law’s Tongue: Of all the different oxygen producing plants, this one is unique since it converts a lot of CO2 (carbon dioxide) to O2 (oxygen) at night, making it ideal to have several in your bedroom. 6-8 waist high plants are needed per person to survive if there is no air flow (meaning you could live in a completely air sealed room if you had these plants and the Areca Palms present). 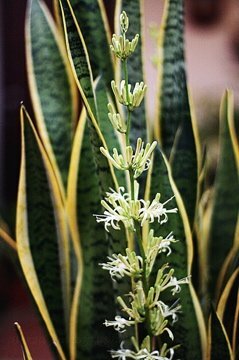 The snake plant also removes formaldehyde from the air. 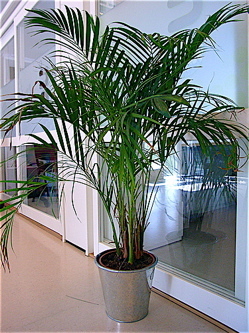 #3 Areca Palm: This plant removes xylene and toluene from the air, but also happens to convert a lot of CO2 (carbon dioxide) to O2 (oxygen) during the daytime. Having four (shoulder high plants) of these per person in your household provides enough oxygen to survive on during daylight hours! They need to have dust and grime wiped off of their leaves once a week, or as often as daily if you live in a city with very bad air quality such as Delhi. #1 Madagascar Dragon Tree a.k.a. Red Edged Dracaena: As a popular house plant that needs little attention, it best removes benzene, formaldehyde, xylene and toluene from the air. It cannot tolerate direct sunlight yet it does well in fairly well indirectly lit areas. It is more susceptible to becoming damaged from over watering than infrequent watering. 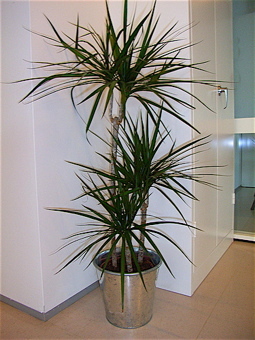 #2 Warneck Dracaena: One of the most popular clean air plants, this one removes benzene, trichloroethylene, xylene and toluene from the air. 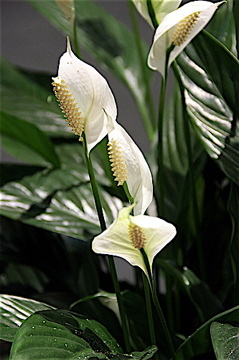 #3 Peace Lily: This species (of which there are a variety of sub-species) thrives best in the shade and with only roughly one watering per week (must be chlorine free water) but never let the soil completely dry out. This easy to take care of house plant removes benzene, formaldehyde, acetone, amonia and trichloroethylene from the air. It also periodically flowers! ~the number of synthetic products and furnishings in your home. The NASA clean air study recommended 15-18 good sized oxygen producing plants and air cleaning plants for an 1,800 square foot house. Of course that would be an average and you should take into account the various factors mentioned above to decide whether you require more clean air plants than this. According to Kamal Meattle during his TED talk, he recommends at least 10 plants (a variety of night and day oxygen producing plants as well as air purifying plants) per person if the environment is in a city with very poor air quality. Of course, it's best to start with just a few oxygen producing plants in your home and increasing the number over time. Clean air plants have varying needs. ~Avoid placing them in corners with stagnant or no air flow or by radiators that produce excessive heat which can damage them. ~Indirect sunlight is best for the air cleaning plants mentioned (because they are mostly shade growing jungle plants) but other types of flowering plants will usually need some direct sun. ~Take them outdoors at least every couple of months for a day or two. ~Clean or dust their leaves about once a week, more often in a dirty city. ~Over-watering is more harmful than under-watering, allow the soil to get fairly dry between waterings (except for the peace lily and your sprouts). ~Mist the leaves since these are jungle plants that like humidity. ~Use an organic fertilizer on occasion such as diluted ocean water, seaweed extract and/or pour the soak water into the soil of your plants left over after germinating your nuts, seeds, grains, legumes and sprouting seeds. But another side benefit is going to be the therapeutic effect of having more greenery around you. The colour green has a soothing, healing effect and considering that it is the predominant colour in nature, people have a natural inclination to feel the most at ease in settings that contain this colour. It is one of the great ways to deal with stress. When detoxing your body, approximately 70% of it occurs through breathing, 20% through perspiration, 8% through urination and 2% through the bowels. I hope you can now understand the utmost importance of having clean air in your home! You will really begin to feel the benefits of these air purifying plants when you engage in diaphragmatic breathing exercises on a regular basis. In a stuffy, poorly ventilated building, people generally breath improperly because the air is so toxic. When the air is vibrant and full of life-force energy, you naturally want to take big deep breaths all the time. Click to return from "Oxygen Producing Plants" to the "Factors of Longevity" page.